The statue of Attila Jozsef is quite similar to him. It is sitting, lost in thought just like Attila Jozsef would while creating his masterpieces. 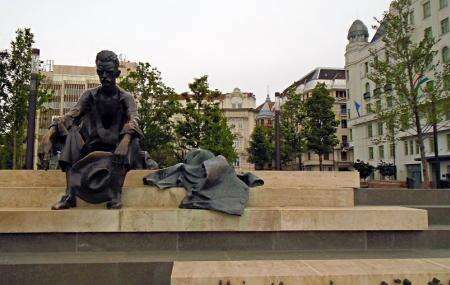 Attila Jozsef was a well known Hungarian poet during the 20th century and his works are still an important part of the cultural collection of Budapest. Attila Jozsef’s poems came from the bottom of his heart as he had to face quite an ordeal in his young days. Living his poverty, his father had abandoned his family of four just when Attila was 3 years old. This statue is made in his memory. How popular is Attila Jozsef Statue? People normally club together Kiscelli Museum and Szechenyi Medicinal Bath while planning their visit to Attila Jozsef Statue. Nice place to relax alongside Danube river. You can easily notice statue of Attila Jozsef after visiting Parliment. I felt as if I was sitting by the River Danube and thinking poetically. Its location and details made me to think in the way that Attila József had done📖.